Besides being mouthwatering, this smoothie is also high in protein, thus a great meal replacement or after workout replenishment. 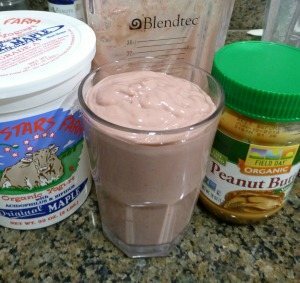 Christine and I would love to know if you try this peanut butter blasta smoothie – please leave a comment below. Happy Blending! Great to hear you found a smoothie that’s right for you. Chalky protein powder be gone! This is actually one of my favorite recipes, the lack of comments leads me to believe not that many people have tried it yet. This sounds just up my street. I am a 63 year old male type 2 diabetic +- 10 years and on meds. I do a lot of driving and get very sleepy (Not fatigued) quite suddenly. Could be 10.30am and had a “good” breakfast Oats or scrambled egg and baby tomatoes or similar. And then within 4/5 minutes if i could i would stop next to the road, and am very sure i would be fast asleep as the vehicle came to a stop. I am going to try this smoothy with my hand blender. Got to do something as i get older the situation will not improve on its own. Thanks, Frank. It was tasty indeed, but not quite in line with my current nutritional goals… A solid go-to should I ever crave for a milk shake. Nice :) I hear you, this is more of a “treat” smoothie for me too. It was good but way to much peanut butter. The whole smoothie just taste like peanut butter. I guess it lives up to its name ;) Try just a tablespoon of peanut butter if you make it again. Is Hershey’s unsweetened cocoa same as raw? Hershey’s unsweetened cocoa is not in the same ballpark as raw chocolate (cacao). Check your local health food store or online at Mountain Rose Herbs for raw chocolate. I don’t want to get fat eating these healthy smoothies, how can this be shrunk down even even using low fat yogurt? To reduce the calories in this smoothie you can use low-fat yogurt and only 1 tablespoon of peanut butter. Yes Ryan, I do understand but 500 cal. 55 carbs and 30 sugar are too much for me. where is 20g of protein? how big are your peanut butter tablespoons? I use cronometer.com for nutritional information. The 2 tablespoons of peanut butter provide 8 grams or protein. The cup of yogurt 9 grams. The renaming 3 grams is from the fruit. This will vary depending on the peanut butter and yogurt used. I plan on making this tomorrow is there something I use instead of the cacao powder? I would simply omit the cacao powder, Trista. hi there… would it be okay if i used vanilla yogurt or does it have to be plain yogurt? Vanilla yogurt is perfectly fine, Marina. hI Ryan, I absolutely love your smoothies! I do have a question though. Can I use Powdered Peanut Butter? Sure you can use powdered peanut butter, Reba. Let me know how your smoothie turns out.